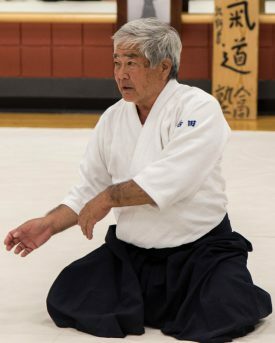 Salt Lake Aikikai welcomes Glenn Yoshida sensei’s return for an aikido seminar July 20-22, 2018. Yoshida sensei entered the deshi program at Hombu Dojo under the second Doshu, Kisshomaru following his university studies. For years, he taught English, trained daily, and provided translation services for the Aikikai organization. After his participation in the deshi program, the Aikikai sent Yoshida sensei to Spain to teach. Eventually, Yoshida sensei returned home to Hawaii. In 2011, Yoshida sensei was instrumental in organizing and bringing together all of the aikido practitioners in Hawaii to host the founder’s grandson, the current Doshu, and great grandson, Hombu’s Dojocho, for the 50th anniversary of the Hawaii Aikikai Big Dojo. In 2014, Yoshida sensei was awarded the rank of seventh dan from the third Doshu, Moriteru Ueshia. Yoshida sensei is dojo–cho of Aikido Renshinkan Hawaii and teaches a weekly keiko at the Hawaii Aikikai Big Dojo. Sunday – Potluck at Sano Sensei’s home, 7:00p. The cost to attend the seminar is $60 for an individual, $70 for a family. The cost for a single session is $30 for an individual, $40 for a family.